I remember nothing of the plot of the first Sherlock Holmes movie, but it didn't seem to impede my enjoyment of the 2nd installment of this sleuthing franchise, directed by Guy Ritchie and starring my love, Robert Downey Jr and Jude Law. Sherlock Holmes: A Game of Shadows also features one of my favorites from the series Mad Men (Jared Harris/ Lane Pryce) in the role of Holme's nemesis, Dr. Moriarty; along with the official Girl with the Dragon Tattoo, Noomi Rapace. The same elements used in the first film, work to make this fast-paced, studio vehicle equally or perhaps more fun: Downey carrying the film - slightly insane, with irrepressible humor and uncanny abilities (not unlike his Iron Man persona in many ways). The homosexually tinged banter and loyal friendship between Holmes and Watson. All being held together with the filmmaking technique of magnified, slow motion examination of each action sequence and fight scene. If you're going to see this film looking for these elements, you won't be disappointed! Holmes brother, Mycroft, (played by Stephen Fry in this latest movie), is a government official who appears in three stories: he's supposedly more gifted than Sherlock in matters of observation and deduction, but prefers to spend his time at ease in the Diogenes Club. 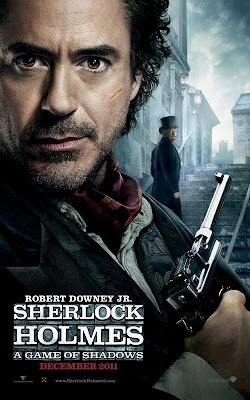 I'd always assumed all the fighting, and physicality was written into these Guy Ritchie versions to suit the film's purposes, but now I know that in several stories Sherlock Holmes is said to possess above average physical strength, knowledge of martial arts and carried several weapons.